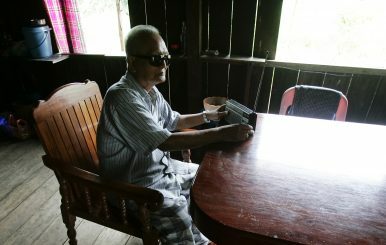 In this March 7, 2006 photo, former Khmer Rouge leader Nuon Chea sits at his jungle home near the Thai-Cambodia border. Nuon Chea was convicted of genocide in a tribunal in Phnom Penh last month for his role as Pol Pot’s deputy in Cambodia. Known as Brother Number Two, at age 92, he is the oldest surviving senior member of the Khmer Rouge and now one of those held responsible for the deaths of 1.7 million people in Cambodia – a fifth of the population – from execution, overwork, disease, and famine from 1975-1979, in the regime’s violent campaign for an agrarian utopia. His conviction came along with the conviction of one other Khmer Rouge leader: Khieu Samphan, age 87. In 2003, I conducted a rare interview with Nuon Chea at his home in Pailin, a remote jungle village of Cambodia. As a graduate student at Princeton University, I was in Cambodia on a summer fellowship, reporting for the Associated Press. With Pulitzer Prize-winning AP photographer David Longstreath, I visited Pailin on the occasion of Cambodia’s parliamentary elections to report on how the Khmer Rouge octogenarian old guard, who now lived there, handled democracy. The young man that David and I had hired as our driver for our roadtrip from Phnom Penh to Pailin and back turned out to be a relative of Khieu Samphan. Our driver offered to take us to Nuon Chea, and we took him up on his offer. David and I walked up the steps to Nuon Chea’s small teak home, raised several feet on stilts above the earth to protect against floods, and surrounded by jungle. Nuon Chea and his wife invited us to their table, and his wife served us her homemade soy milk as a beverage. They were an elderly couple, and Nuon Chea was mainly bald, with a fuzz of white hair. David broke the ice by pulling out his wallet and showing pictures of his two small sons. As we sat at the simple wooden table, I spoke with Nuon Chea in French, our only common language. Nuon Chea’s wife watched with a look of pride on her face, proud that people still came to see her husband. I asked Nuon Chea if he had any regrets. With a soft-spoken, quiet voice, he said that no, he had no regrets at all. I marveled at how someone who had had such a role in systematic violence and the deaths of 1.7 million people could so calmly state that he lacked regrets. I thought of political philosopher Hannah Arendt’s description of “the banality of evil,” coined while watching the trial of Nazi Adolf Eichmann. The middle-aged bureaucrat Eichmann had overseen systematic killing of Jews, through bureaucratic procedures. The phrase “banality of evil” resonated in my mind while sipping soy milk at the simple table of this soft-spoken man with a fuzz of white hair. In Phnom Penh, there is a museum to the Killing Fields of the Cambodian genocide. The museum is a park with gently rolling hills of grass. It contains piles of skulls of the dead and the sites of mass graves. As I walked through it when visiting, I accidentally kicked bones that had been unearthed as I veered off the main path. And Nuon Chea said he had no regrets. The next day, the elections went without a hitch in Pailin. David and I went to the Pailin polling stations to report on activities there, which occurred without violence or electoral improprieties. Former Khmer Rouge officials came to vote, along with their younger relatives. I asked a few people who emerged from the voting booths whom they had voted for. Not a single person would tell me – even relatives of candidates. They explained that with their new principles of democracy, it was every person’s right to keep their vote private. This quiet election was certainly far removed from the violence that had engulfed Cambodia so many decades earlier. After the election, our driver drove David and me back from Pailin to Phnom Penh in a beat-up old white Toyota sedan. A heavy storm underway caused flooding on the bumpy mud roads on which we drove. Our driver drove slowly to avoid the deep puddles and bumps of roots that jolted us violently in the car. On the jungle road between Pailin and Phnom Penh, the car broke down. The driver got out and popped up the hood to look at the engine, but did not know what to do. I worried that somehow we were in a trap, caught on a remote mud road in a storm with Khmer Rouge relatives and few means of communication. I borrowed David’s AP satellite phone and did what any Pennsylvania girl would do in such a situation – I called my dad, who is good with engines, to see if he could talk us through a repair. The call went through but then broke off and I could not reconnect. Eventually someone came and got the engine going, and we resumed our drive back. It had not been a trap. We arrived in Phnom Penh after dark. During the drive, our driver related that he had been a child soldier himself and had lost both parents. At the trial in November, justice was laid down decades after the Cambodian genocide. It had been a nearly 40-year process, and a victory for humanity. I can’t help but wonder if Nuon Chea still has no regrets. Shelly Culbertson is a senior policy researcher at the nonprofit RAND Corporation. She is the author of The Fires of Spring: A Post Arab Spring Journey Through the Turbulent New Middle East (St. Martin’s Press, 2016).